This map depicts the area that became the vicinity of Kensington Avenue between Allegheny Avenue and Tioga Streets, today a portion of the Harrogate neighborhood. 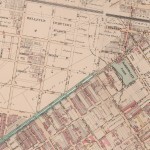 The waterways visible here have disappeared from the landscape, but Frankford Road, today’s Frankford Avenue, is indicated by the brown line running diagonally across the lower right corner. 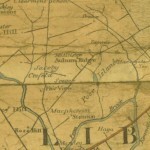 Published in 1808, the map also documents a history of earlier times. Visible near the center is an area called “Poor Island,” a tract owned by Peter Nilsson Lycon (or Laican) from 1671 to 1696. Lycon, a Swedish settler, operated a grist mill at this location. Next to Poor Island, the label “Harogate Tav.” indicates Harrowgate Tavern, a remnant of the Harrowgate Springs resort developed by George Easterly in the late eighteenth century. “Macpherson,” below Poor Island, indicates the country seat of General William Macpherson, who acquired these lands in the 1790s. At the outbreak of the American Revolution, Macpherson was a cadet in the British service, but he resigned and served under General Washington throughout the war. Macpherson later served as Surveyor of Customs of Philadelphia, Inspector of Revenue, and Naval Officer of the Port of Philadelphia. He gained popularity and earned the rank of general after he took command of a militia battalion known as the “Macpherson Blues” during the Whiskey Rebellion of 1794. Macpherson is commemorated by McPherson Square, located at Kensington and East Indiana Avenues. Continue through this gallery to trace the development of Harrowgate as an industrial neighborhood. A Plan of the City of Philadelphia and Environs, Athenaeum of Philadelphia. View and explore the complete map on the website of the Greater Philadelphia GeoHistory Network. By the 1840s, industry came to the Harrowgate area, as indicated on this map by the chemical works and dye works along Frankford Road. Dye works and other textile-related businesses became staples of Harrowgate’s industry. Another indication of industrialization is the Philadelphia and Trenton Railroad, which runs parallel below Frankford Road. Although most of the area remained lightly settled, the map documents rows of houses near the chemical and dye works along Frankford Avenue (the houses are labeled “Roseville,” partially visible at the right edge of this detail). 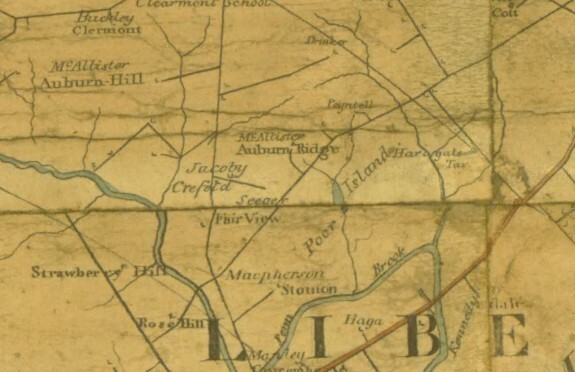 In addition to long-used thoroughfares connecting to Philadelphia, this map shows newer roads such as Harrowgate Lane, which extends from below Frankford Road toward Nice Town Lane (a street that no longer exists) at the top of the map. The Harrowgate Hotel occupies the former site of the eighteenth-century Harrowgate Springs resort, and the Macpherson property (here spelled McPherson) remains visible. All were within Northern Liberties Township, an area consolidated into the City of Philadelphia in 1854. 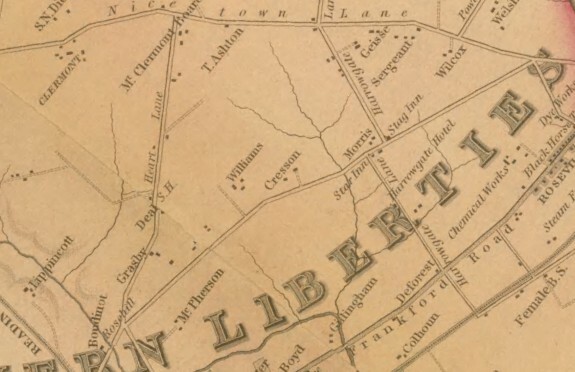 In the same year depicted by this map, surveyors authorized by the Pennsylvania Assembly produced a plan for extending Philadelphia’s street grid into this township, but more extensive development of this area as an industrial neighborhood remained in the future. Map of the county, including the various districts and townships prior to consolidation. Charles Ellet, Jr., Map Collection, Free Library of Philadelphia. View and explore the complete map on the website of the Greater Philadelphia GeoHistory Network. 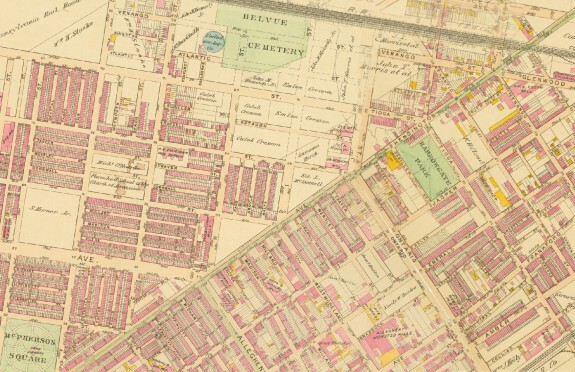 Harrowgate developed significantly between the 1840s and 1890s, especially with factories and worker housing southeast of Kensington Avenue (as seen in the lower right of this map), closest to the Delaware River. 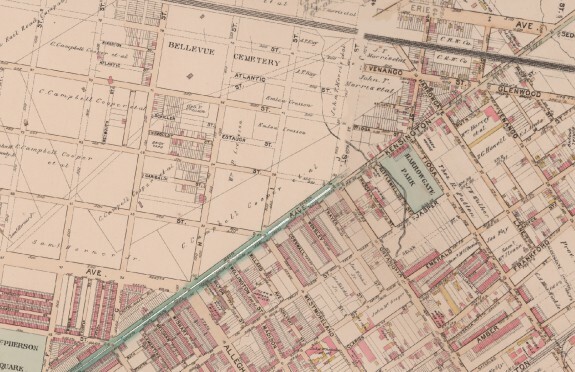 By 1895, two parks served the growing neighborhood: Harrowgate Park, at Kensington Avenue and Tioga Street, and McPherson Square (partially visible in the lower left corner here). Signs of new and future development also are evident northwest of Kensington Avenue, where a street grid overlays earlier roads and property lines. Although largely unpopulated, this portion of Harrowgate by this time had gained a brick yard, a few industrial buildings, several blocks of houses, and Bellevue Cemetery (founded in 1885). In contrast to the streets southeast of Kensington Avenue, which run parallel to the Delaware River, the grid for new development to the northwest extends from original city grid of Philadelphia. Atlas of the City of Philadelphia. George W. & Walter S. Bromley, Civil Engineers, Athenaeum of Philadelphia. View and explore the complete map on the website of the Greater Philadelphia GeoHistory Network. 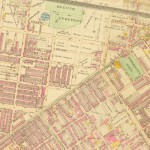 This map shows the dramatic change in Harrowgate northwest of Kensington Avenue by 1910. Although some open tracts remained, by this time much of the area had become occupied by houses and industries such as the Luithlen Dye House and the Lee Hosiery Mills. By 1910, new community buildings had also been constructed. The Ascension of Our Lord Church and School, which can be seen left of the center of the map surrounded by densely developed blocks of housing, served the large Catholic community in Harrowgate. The Philip Sheridan Public School can be seen just northeast of the Ascension Church. Many of the streets remained unchanged between 1895 and 1910. Kensington Avenue still dissects this map in two from bottom left to top right. Frankford Avenue can still be seen in the lower right corner of the map, and Allegheny Avenue is visible to the far left intersecting Kensington Avenue. Harrowgate Lane, however, changed names in the early twentieth century to Atlantic Street. Atlantic Street can be seen two streets to the right of Harrowgate Park. Atlas of the City of Philadelphia, 1910. Athenaeum of Philadelphia. 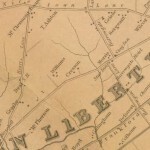 View and explore the complete map on the website of the Greater Philadelphia GeoHistory Network. Fully developed by the 1920s, Harrowgate in this 1962 map is a neighborhood of factories, houses, and community institutions. On both sides of Kensington Avenue, virtually no space remained to be developed. Northwest of the avenue, the area between Venango Street and the Pennsylvania Railroad had become a corridor of industry, including Franklin Worsted Co., Richardson Mints, and the Boger and Crawford Hosiery Mills. Many features that have been seen in previous maps remain, including major streets and landmarks such as the Philip Sheridan Public School, Ascension of Our Lord Church, Harrowgate Park, and McPherson Square A prominent addition is the Harrowgate Playground, later renamed Scanlon Playground in honor of Joseph Scanlon. Although Bellevue Cemetery (here spelled Bellvue) is shown on this map, in 1951 burials were moved to Memorial Park in Frazer, Chester County. In the 1960s, the site became the parking lot for Harrowgate Plaza Shopping Center, since closed. Philadelphia Land Use Map. 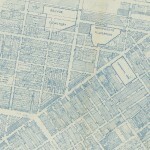 Plans & Registry Division, Bureau of Engineering Surveys & Zoning, Department of Public Works, Federal Works Progress Administration for Pennsylvania, Map Collection, Free Library of Philadelphia. View and explore the complete map on the website of the Greater Philadelphia GeoHistory Network. While Philadelphia expanded rapidly, a variety of transportation systems developed to serve the growing population. Between 1880 and 1890, a steam railway, cable and steam-powered streetcars, and electric trolleys were introduced to Philadelphia. These new forms of transportation helped commuters move throughout the city but could not keep up with the rapidly expanding population. In the face of this growing transportation crisis, Philadelphia adopted two transportation solutions. The first was modeled after London’s steam-powered subway line. The second was modeled after New York’s steam-powered elevated train. In 1901, the plan to build the elevated line was approved by Philadelphia City Council. 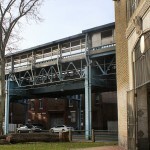 The Frankford Elevated Line was not started until 1915. The finished elevated line helped reduce trolley traffic, increase traffic to the Market Street commercial district, increase traffic to the Kensington and Allegheny commercial district, and made movement to and from the city center and surrounding neighborhoods easier. The present square marks only a small part of the famous Harrowgate Springs that were named by George Easterly, an American Revolution veteran who came to the area after the war. When he arrived he discovered a large spring and built a sanatorium there for affluent Philadelphians. For years Easterly’s community thrived. Wealthy people visited the springs to bathe in the medicinal waters. It is said that George Washington, Thomas Jefferson, and other famous men stopped at the springs on their way to and from Trenton and New York. The entrance was on the Kings Highway, now Frankford Avenue, and the springs were surrounded by a grove of beautiful trees. In 1800, the spring water dried up. Engineers of the time assumed that all the new buildings, inns, and summer homes built around the springs caused the sudden drying. Throughout the nineteenth century, the gardens became overgrown, the inns became saloons, and the area lost much of the beauty it held in the eighteenth century. 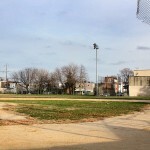 The block-long park that exists today was established just prior to World War I and fits well with the Philadelphia tradition of open parks (Fairmount Park and other neighborhood parks such as McPherson Square and Womrath Park). Parks such as these extended William Penn’s original founding concept of the “Green Country Town” to areas outside the boundaries of the original city plan (Center City). 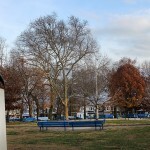 The park today serves a community that is predominantly Hispanic. Forty-eight percent of the 20,619 people living in Harrowgate are Hispanic. The majority of this population are migrants or descendants of migrants from Puerto Rico, which became linked to Philadelphia in the nineteenth century as Puerto Ricans came to the city to find work as laborers. During World War II, Harrowgate experienced a growth in Puerto Rican population as a result of various work programs developed by the government to bring Puerto Ricans to the Mid-Atlantic region to work in factories and farms. Between 1950 and 1970 the Puerto Rican community grew substantially in Philadelphia and the region. Puerto Ricans settled largely in areas north of Center City, including Harrowgate and Kensington. By 1970, the Puerto Rican population of Philadelphia had grown to more than 60,000. 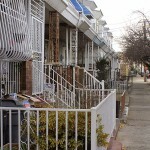 The Harrowgate neighborhood is low income, as well. The mean income of Harrowgate residents falls just over $10,000 below the Philadelphia average of $34,000. Educational attainment also is low, as nearly sixty percent of the residents of Harrowgate have not finished high school, more than forty percent higher than the city average. Harrowgate today struggles with crime and drugs - but this is not to say the sense of community people have is less than anywhere else. Many Harrowgate residents today are devoted to restoring their neighborhood, helping one another, providing programs for the neighborhood's youth, and keeping schools, churches, and other civic buildings operational. 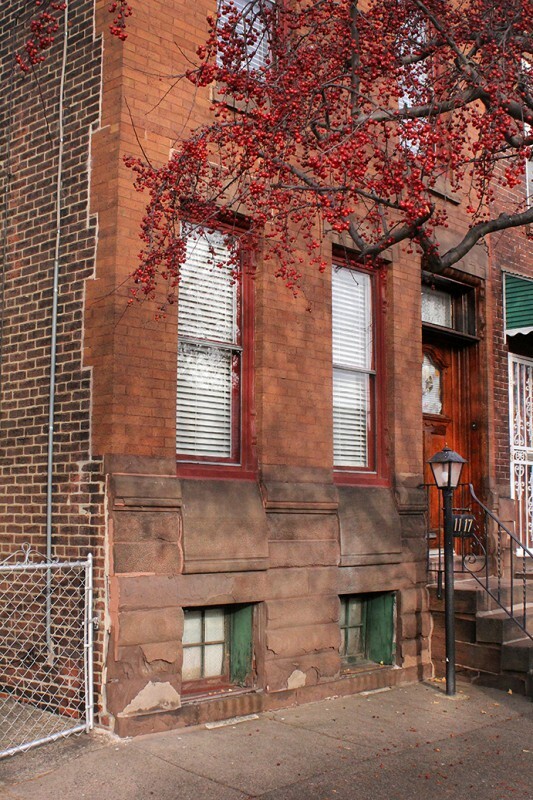 This two-story brick home constructed for Thomas Ryan around 1905 represents one small part of a larger story about Irish immigration to the many Philadelphia industrial neighborhoods, including Harrowgate. A morocco (leather) worker at a nearby firm, Thomas Ryan was born in Ireland in 1868 and came to the United States in the late 1880s or early 1890s. 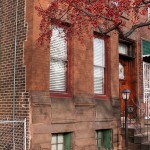 He married Lizzie Barr, a Harrowgate native, in 1900 and lived on nearby K Street before moving into this house in 1905. Interestingly, Lizzie Barr’s parents lived in the house connected to 1117. The close ties of families are synonymous with the industrial age. Since wages were low and living was expensive, close-knit families could generate income and provide for one another's livelihoods. Irish immigration to the United States increased between the 1820s and 1860s, with the greatest growth occurring in the wake of the potato famines of 1845 and 1852. When the Irish arrived in the port cities, they usually stayed due to their inability to move inland. As a result, Philadelphia became congested with Irish immigrants. Despite meeting resistance from Nativist groups in Philadelphia, Irish immigrants were able to plant themselves in certain neighborhoods of the city, especially Harrowgate, and build a new life. Philadelphia's newly established textile industries in Manayunk, Kensington, Northern Liberties, and Harrowgate were great places for Irish immigrants to settle and find work. Irish immigrants had typically done textile work in their homeland and so did not have too much difficulty finding work in the textile industry of Philadelphia. They also became laborers on civic building projects. In Harrowgate, the Irish dominated the population throughout the nineteenth century and into the early twentieth century. Tioga Street illustrates the density with which new homes were being built during the industrialization of Harrowgate. Closely packed together, these two-story row houses accommodated the maximum number of laborers and allowed for maximum profits for developers. Over time, they have been adapted by later generations of occupants. 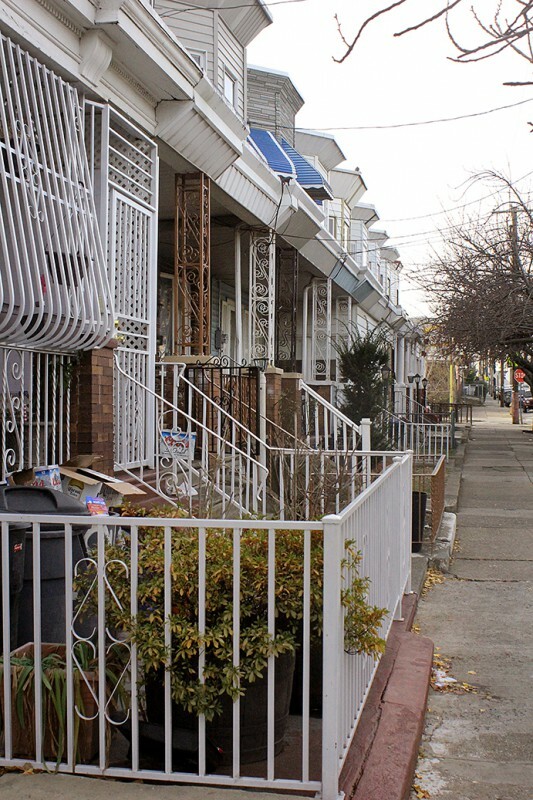 In some areas of Harrowgate steel grating, known as belly porches, encloses the porches of some homes and shows the Puerto Rican influence of Harrowgate’s more recent population. 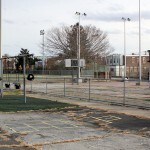 Today, the playground, connecting community center, and public pool serve the community. In the summer months, children from the neighborhood hang out on the playground, play on the baseball field, and swim in the pool, and they use the community center. 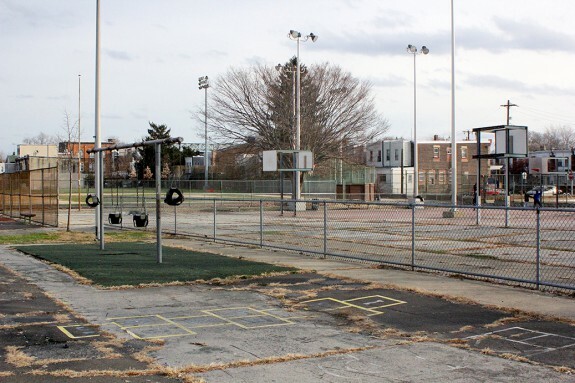 Just down the street from the playground, on Tioga Street, Officer Frank Rivera established the Harrowgate Police Athletic League Center in September 2011. Rivera’s PAL center offers support and community building to people under the age of 18. Kids typically go after school and get assistance with homework or other school assignments from a volunteer teacher and also have recreational time. In spring 2013, 500 kids registered for the Harrowgate PAL. Of those, approximately 200 registered for structured programs including soccer, flag football, basketball, and boys and girls mentoring. Rivera also established a softball league for older children. The games are usually played at Scanlon field and offer an opportunity for families to get involved and help build the Harrowgate community. Like the area around Harrowgate Springs, which became Harrowgate Park, this area was largely undeveloped in the early nineteenth century with only small buildings and a sparse population. In the second half of the nineteenth century, however, more and more people settled in the area. The most dramatic change in the Harrowgate landscape came with industrialization from the 1850s through the end of the nineteenth century. In a matter of a few decades, dozens of industrial plants, factories, and mills dotted the Harrowgate neighborhood. Maps of the area reveal this dramatic change. 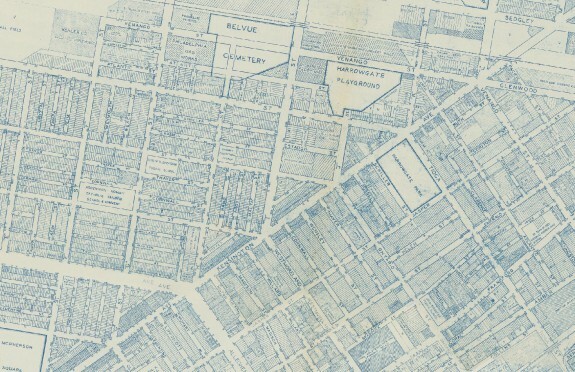 A map of Harrowgate in 1849 shows very few buildings in the area, but by 1858 the grid of streets had been laid and hundreds of buildings, either residential or industrial, were constructed or were being constructed. By the end of the century, the entire area was densely populated. The large factory building just behind Scanlon Playground is the Richardson Mints building. The company, established in 1893 by Thomas D. Richardson, produced and sold mints and other candies throughout the neighborhood, city, and later country. Richardson first started selling the mints at a corner market in Harrowgate, but by the turn of the century, he and his two sons incorporated Richardson mints, mass producing their goods and selling them throughout the area and later the country. The factory present today was built in the early twentieth century. 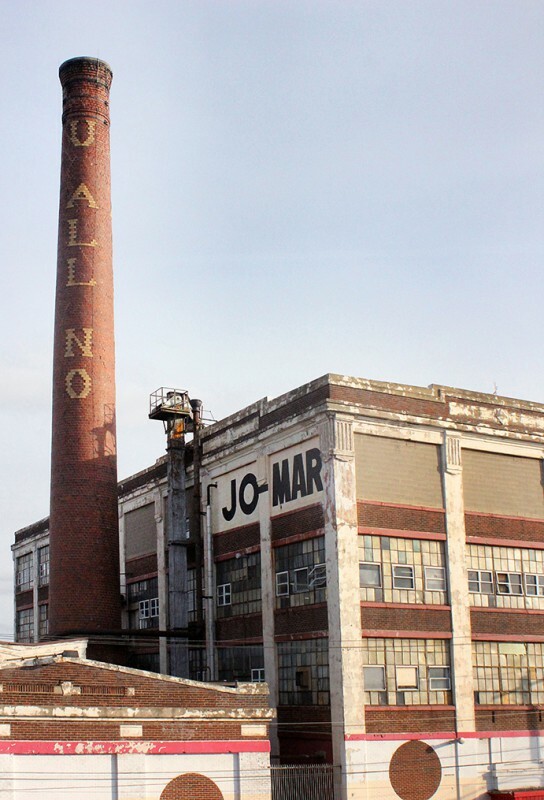 The smokestack with the Richardson’s slogan “U All No,”— still visible—served as a larger-than-life advertisement for the company. The factory remained operational until the 1970s. The business then moved to Canajoharie, N.Y. Today, the building is occupied by the Jomar Textiles Company. 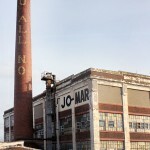 The Jomar outlet continues the textile industry tradition of the neighborhood. The close proximity of residence to factory was a staple of the Industrial Era neighborhood. Harrowgate's factory buildings were surrounded by the factory workers' homes. Luithlen Dye House represents just a small piece of a much larger textile industry that grew in Philadelphia. The textile industry in the United States, largely based in New England, grew along with industrialization in the late eighteenth and nineteenth centuries. The industry encompassed firms that manufactured staple cotton and woolen fabrics as well as mills that turned the fabrics into goods that were sold to the public. Philadelphia’s textile industry originated with hand-loom weavers in neighborhoods north of Center City and in the industrial village of Manayunk. By the late nineteenth and early twentieth centuries, the textile industry dominated many neighborhoods, including Harrowgate. The presence of the textile industry attracted Irish immigrants, helping to make Harrowgate a predominantly Irish neighborhood. In 1880, Ludwig Luithlen established a dye works company in Harrowgate. In 1895, Luithlen purchased the single-story brick building that remains today at J Street and Estaugh Street. 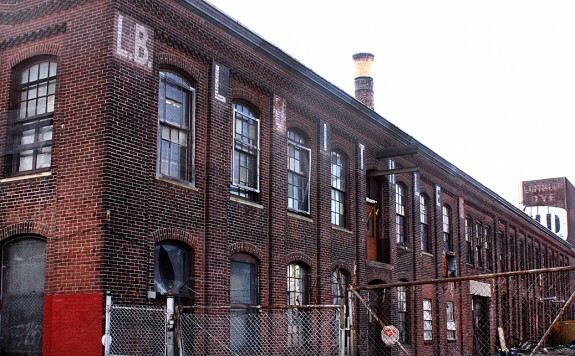 From the turn of the century until the building was sold to the Wayne Mills Company in 2002, the Luithlen Dye House specialized in the dyeing, drying, and finishing of fabrics, yarns, carpets, bindings, tapes, and zippers. Throughout its long operational history, the Luithlen Dye House served the textile industries located throughout Kensington. Textile mills in the area sent their goods to the Luithlen Dye House to be dyed, dried, and finished. After the Luithlen Dye House finished the textile goods, they could be sold. The Luithlen Dye House was very important to the area's textile industry. The Luithlen Dye House was relatively small compared to other city dye houses. For example, the Quaker City Dye Works, located on West Oxford Street in Philadelphia, was a five-story building that occupied an entire city block and had 388 workers employed at the end of the nineteenth century. In comparison, the Luithlen Dye House only employed thirty-one workers at the turn of the century. That number never rose to more than one hundred throughout the twentieth century. In the 1940s, the peak years of the dye works production, the building held forty-four dye kettles. These kettles were used to dye fabrics, yarns, carpet, bindings, tapes, and zippers. The kettles were heated by steam supplied by two 500-horsepower, oil-fired boilers. 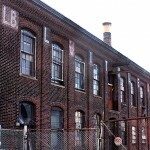 The two-story brick building served as a storage area and the drying room. Although the name Luithlen has always been associated with the dye works, it was owned and operated by several different families throughout the twentieth century. Emil Viet ran the Luithlen Dye Works between 1916 and 1919, when the Wiegand family bought the company. The Wiegand family operated the dye house until 2003, when the company was again sold to Wayne Mills. Wayne Mills, a large textile company based in Germantown which has purchased many failing textile businesses throughout the twentieth century, sought to expand its textile production to include custom dyeing and wet processing. Wayne Mills moved the Luithlen Dye operations to a new “state-of-the-art” facility in Germantown. The surviving building in Harrowgate illustrates the changing nature of industry in the neighborhood. From 2002 until September 2013, the building was owned and occupied by the Ward Elicker Casting Company. The company created metal castings for emerging Philadelphia artists and renowned contemporary sculptors including Tom Otterness, Julian Schnable, George Segal, and Kiki Smith. However, the decline of the economy in recent years caused a drop in orders. Thefts hurt the establishment as well. On multiple occasions, pieces that were nearly finished were stolen, which caused a significant loss in profit. The future of this old dye house is undetermined. Old industry buildings being repurposed for the use of artistic creation represent the change in Philadelphia from an industrial to a creative economy. Today, Philadelphia supports a vast array of creative businesses. In fact, Philadelphia has more workers in creative fields than the national average. The rise of artists in an area is usually the first sign of revitalization. The KenCrest Kensington Early Childhood Center serves as an example of an old building repurposed to serve the current community’s needs. Previously, this building was the Wilkey Memorial Presbyterian Church. As the congregation dwindled in the late twentieth century, the church offered space for rent in order to keep it open. KenCrest rented some of the space to provide education for special-needs children to the area. When the church no longer could afford to stay open, Kencrest purchased the church and converted it to serve the needs of the community. By 2012 the KenCrest Kensington Early Childhood Center was providing special care and education to children from the area with disabilities including autism, cerebral palsy, and Down syndrome, those with physical and social/emotional challenges or developmental delays. In 2013, the school supported 175 children in eight classrooms. All of the children were ages three to five, and 65 percent were of Hispanic descent. Ninety-nine percent were from families living at or below the poverty level. 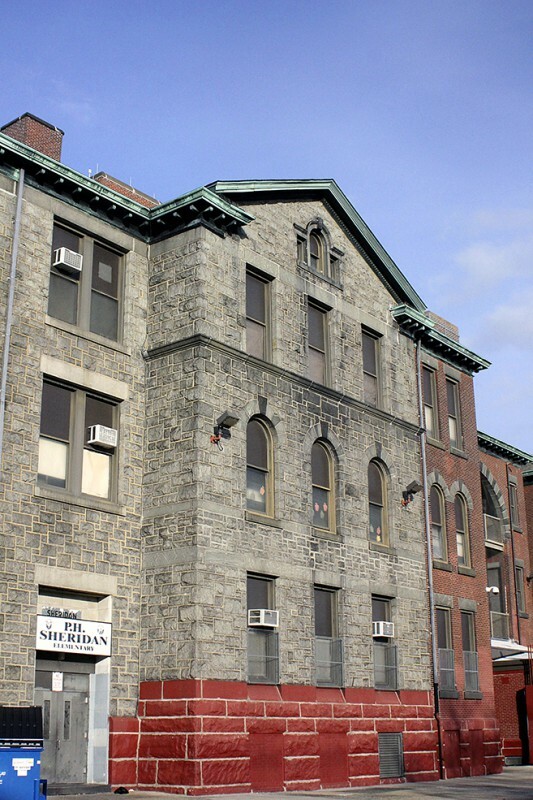 The Sheridan Elementary School, built as a vocational training school in the early twentieth century, is named after the Civil War General Philip Henry Sheridan. Sheridan was the third child of six of John and Mary Meenagh Sheridan, immigrants from the parish of Killinkere, County Cavan, Ireland. The naming of the school after a prominent Irish-American reflects the dominance of the Irish culture in nineteenth-century Harrowgate. Stretching half a city block and standing three stories tall and one of the only schools in the area at the time of its construction, the Sheridan School accommodated a large population of children in the early twentieth century. 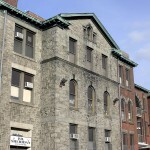 During its years as a vocational training school, girls and boys were educated separately to equip them with skills that would allow them to find work in Philadelphia’s booming economy. Girls were taught skills to allow them to find work as domestic servants or seamstresses, while boys were taught skills in workshops that would allow them to find work in industry. This school represents a number of important themes on the tour. First, the presence of the school in this location identifies it as an area with a large community that requires education. Schools are important civic buildings for any neighborhood. Students in public schools were raised to become industry, factory, or textile workers. The school shows that industry imprinted every aspect of life in Harrowgate. Today, the school suffers in a number of ways. First, it is poorly funded, which lowers the education the children receive. Student scores on the PSSA (Pennsylvania System of School Assessment) standardized tests for each of the four grades average around 25 to 30 percent, which is over 12% under the city average. There is no music or art program at the school and very few after-school or extracurricular programs. 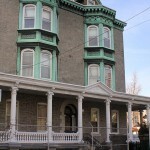 Michael O’Rourke, an Irish immigrant and municipal contractor who worked on the construction of the Market-Frankford El, built the Guckin Funeral Mansion in the first decade of the twentieth century. 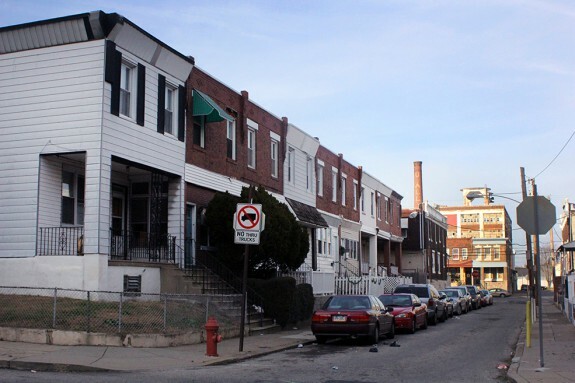 In 1906, O’Rourke bought the land on G Street between Cornwall and Thayer Streets and built homes for himself and his three sons: Michael Jr. (3303 G Street), John (3305), and James Patrick (3309). The building located at 3330 (the Funeral Mansion) was built for himself and his wife, Elizabeth. It is a three-story federal style building with elements of Greek revival and Queen Anne. The mansion stood above the majority of residential homes throughout the area and occupied a significant amount of real estate compared to other residences. Behind the mansion was a small stable and carriage garage. The grandiose mansion reflected the high status of the O'Rourke family. 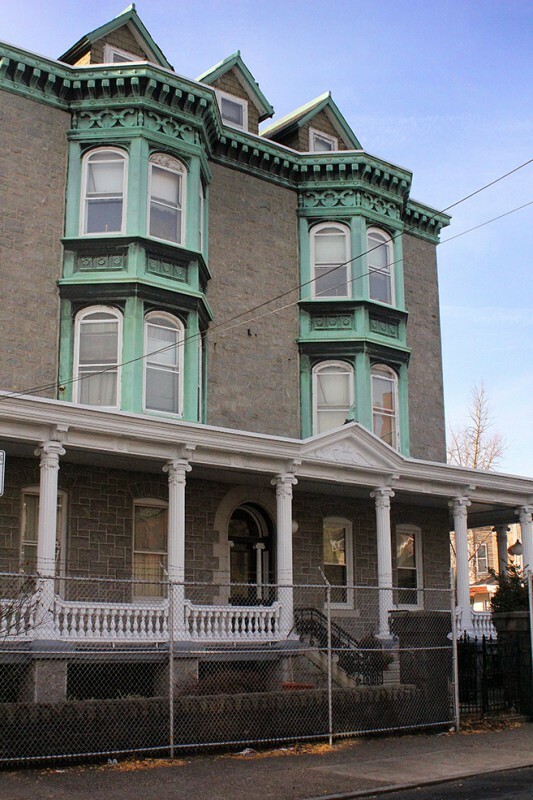 When O’Rourke died in 1910, Elizabeth moved to 816 E. Allegheny Avenue, a far more modest home. The mansion was sold on August 27, 1914, for $29,000 to Conrad Campbell and began a transition from residential to commercial use. Conrad along with one of his sons, James, founded C and J Music and offered music lessons at the mansion. Campbell also rented out parts of the mansion to boarders. Conrad Campbell’s son quit the music business by the late 1920s, and Campbell himself retired from teaching music in the 1950s. Campbell died in 1960. Andrew Guckin had started his own funeral business and operated it out of a small row home in 1953. In 1960, following Conrad’s death, the Guckin family bought the mansion. Andrew Guckin had the mansion restored to working condition and turned it into the funeral parlor for his business. Much of the original woodwork was saved during restoration, including the archways and mantelpieces. Guckin and his daughter Betty Ann Guckin run the funeral mansion, which provides funeral services to families of all faiths, ethnic groups, and beliefs. They have been serving the community now for more than fifty years. Churches and other religious buildings play an important role in building community within a neighborhood and serve as reminders of the community’s history. Ascension of Our Lord Church, taking up nearly an entire city block, stands as a reminder of the very large population of Roman Catholics who lived in Harrowgate at the turn of the twentieth century. 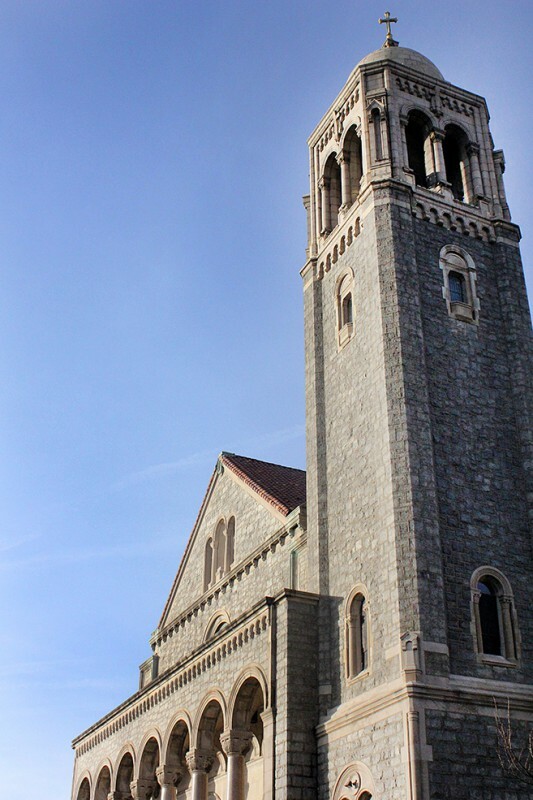 The three-story church, built by John Flynn using Port Deposit stone, has a first-floor sanctuary with the capacity to seat 1,100 people and sixteen classrooms on the upper two floors. In 1923, the Rev. 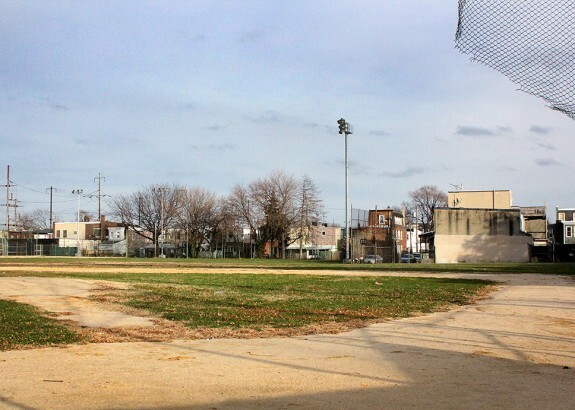 William Casey built a parish baseball field located at I and Tioga Streets to provide children of the parish a place for activity. Because construction costs were extensive and difficult for Casey to pay, he developed a plan to raise money by asking Babe Ruth, star of the New York Yankees, to come to the field and play a game with the Ascension team. Ruth agreed to help. The game took place on Tuesday, September 4, 1923, and the opponent was the Lit Brothers Department Store. Ten thousand spectators came to the field to watch. After the game, Ruth signed autographs for five dollars apiece and donated the proceeds to paying off the field. 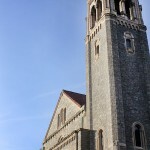 Such a large church and school served the heavily Irish community of the early twentieth century, but the decline of industry after World War II changed both the neighborhood and the church. 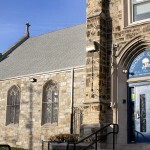 As the neighborhood’s demographics began to change, Harrowgate’s remaining Irish Catholic population resisted African American and Hispanic integration into the church. As fewer people attended service in the mid-twentieth century, however, the church attempted to appeal to African American converts. By the late twentieth century, the church, which at one point attracted 1,100 people a week, no longer filled the pews and was unable to upkeep the massive structure. As a result, it fell into serious disrepair. Despite its impressive exterior, inside the church foundation pillars were damaged and shaky, and piles of flaked-off paint littered the building, the roof was rotting and debris lay everywhere. In 2012 the Archdiocese of Philadelphia closed the church and its fate is unknown. 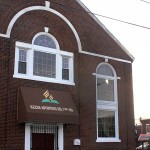 Iglesia Adventista Del 7mo Dia or Seventh-Day Adventist Church located at F and Allegheny Streets is one example of the heavy Hispanic influence of the area. Joseph Scanlon was the Democratic leader of the Thirty-Third Ward and chairman of the Philadelphia Democratic Party. Although Scanlon served in the Pennsylvania State Senate from 1969 to 1970, perhaps his most lasting impact on the community was his popular bar at G and Allegheny. After his funeral, friends, family, and locals met there, the crowd so robust that people lined up outside the bar just to pay their respects to the family. 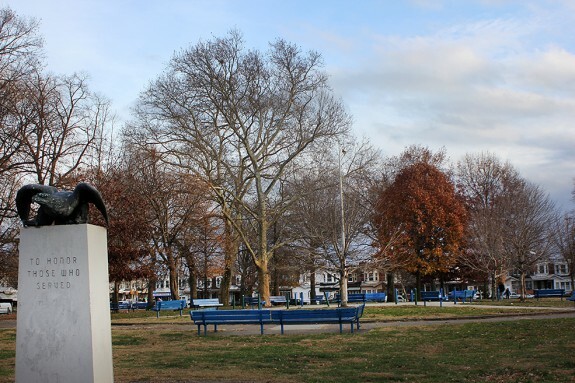 Scanlon’s impact on the neighborhood was memorialized by the naming of the Scanlon Playground after his death in 1970. 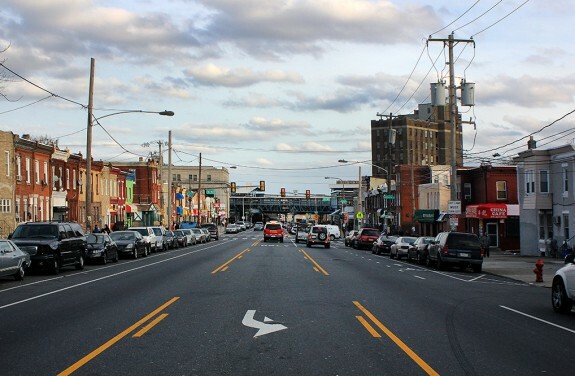 A business district since the late nineteenth century, Allegheny Avenue is lined with small businesses, taverns, medical clinics, and institutions such as banks and churches, Today, the Hispanic character of Harrowgate is unmistakable. Signs in Spanish announce the presence of the restaurants La Casa Buen Gusto, or the Tasteful House, at F Street and Allegheny Avenue; Laberintos de Pasion, or Labyrinths of Passion, at G Street and Allegheny Avenue; and El Sabor Del Trigo, at 702 E Westmoreland Street near Allegheny Avenue. 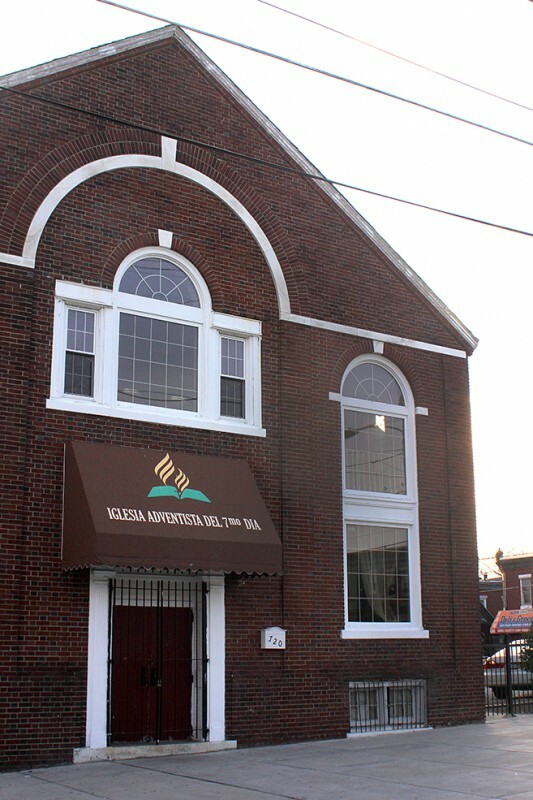 At F Street and Allegheny is the Iglesia Adventista Del 7mo Dia or Seventh-Day Adventist Church. 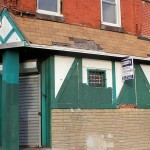 Although the demographics of Allegheny Avenue have changed in the last century, it remains an anchor for the community. 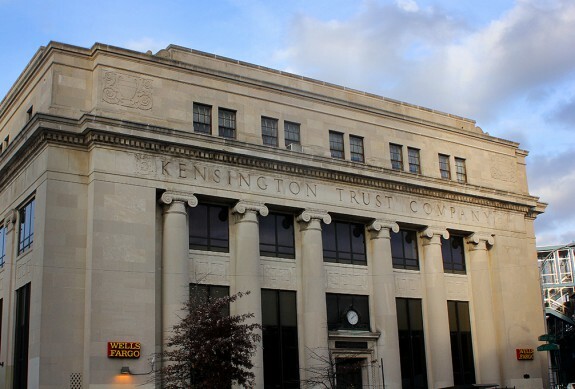 The Kensington Trust Company, which opened its doors on April 2, 1906, was one of seven trust companies that were established that year in Philadelphia. 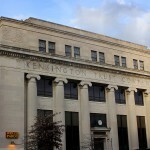 Originally located at Kensington Avenue and Cumberland Street, in 1911 the Kensington Trust Company moved to the surviving building at Kensington and Allegheny Avenues, which was a hub of activity throughout the twentieth century. 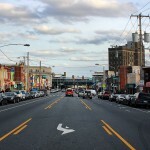 Known as “K&A,” this high-traffic intersection is served by bus routes and the elevated line, which transport people to and from this section of Kensington. While the Kensington Trust Company served the needs of many Harrowgate and Kensington citizens, it was not the only reason people came to K&A. The Midway Theater, saloons, billiard halls, shops, and markets all attracted people to the area. For a small period in the 1970s the street became an outdoor market. The large sidewalks and mass of people were conducive elements for the outdoor market. However, the market closed because local businesses complained that it drew customers away from their stores. 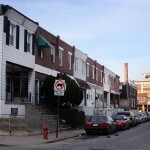 Like many neighborhoods in Philadelphia, Harrowgate, located just northwest of Kensington, experienced dramatic changes as a result of the industrial boom in the nineteenth century. Prior to industrialization, Harrowgate was a small community built around medicinal springs and attracted only the wealthiest of Philadelphia’s citizens. Industrialization, however, transformed Harrowgate. By the late nineteenth century, Harrowgate was a densely populated industrial neighborhood with mills, factories, homes, apartments, and civic institutions such as churches and banks. Irish immigrants, attracted by the large textile industry that existed there, settled in the neighborhood. Germans, English, and Scots also came to Harrowgate during the industrial boom to work in the textile industry. While industrialization transformed Harrowgate from a vacation spot for wealthy Philadelphians in the eighteenth century to a massive community of working people in the nineteenth century, deindustrialization caused dramatic changes in the twentieth century. Despite the boost that Harrowgate’s textile industry got from World War II, by the 1950s industries throughout the neighborhood began to close their doors. There were many causes for deindustrialization. Neglect during the Depression years caused irreversible damage to many buildings and factories. Industry had to share space with densely packed residences, commercial buildings, and office buildings. Industry’s ability to grow was choked off by the narrow streets and congested landscape. After the war, many people migrated to the suburbs to get away from the congestion and overcrowded conditions of the inner city. Harrowgate’s wealth and many traditional elements of community such as schools and churches were lost as a result of deindustrialization. 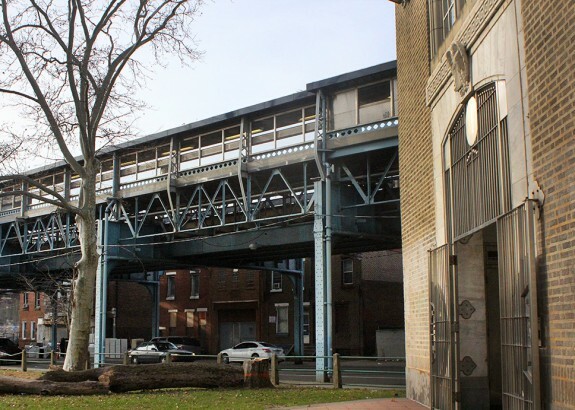 Today, the community that can be seen from the platform at Tioga Street Station of the Market-Frankford El is a place of parks occupied by families and children, streets lined with row houses, repurposed factory buildings, and people coming to and from banks, restaurants, homes, and churches. In marked contrast to its earlier history, forty-eight percent of the neighborhood’s population is Hispanic. The remaining population is thirty-four percent white non-Hispanic, ten percent African American, and four percent Asian. Poverty in the area has led to high rates of crime and drug use. Many of the industrial buildings of Harrowgate have closed, fallen into disrepair, or have been demolished, although some are being put to new uses. 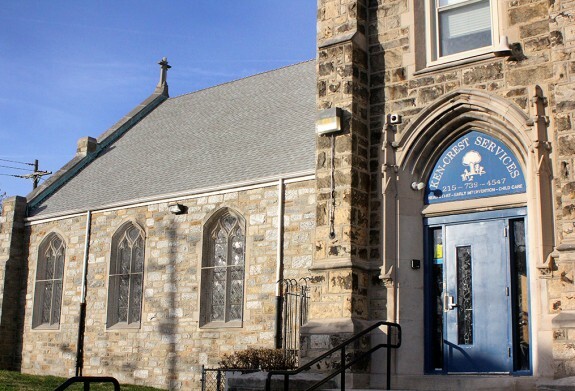 Some of the churches and schools built during the industrial era struggle to stay open because of waning attendance and funds, while new churches, social service agencies, and small businesses serving the Spanish-speaking population are taking root. Take the virtual tour of the Harrowgate neighborhood by clicking on the image gallery located on the right. Jacob Downs earned his Master’s degree from Rutgers University, Camden, in American history. His focus while in the program was the effects of industrialization and urbanization on women during the late nineteenth century. While earning his degree he gained an appreciation for the industrial neighborhoods of Philadelphia. He served as the project manager and primary researcher for the Walking Encyclopedia Tour of Harrowgate. The Walking Encyclopedia Project was supported by a Discovery Grant from the Heritage Philadelphia Program of the Pew Center for Arts & Heritage. Project partners and advisers included the Philadelphia History Museum, the Historical Society of Pennsylvania, Bob Skiba of the Association of Philadelphia Tour Guides, and Patricia Washington Visit Philadelphia. The route for the Harrowgate tour was provided by Francis Ryan, a native of the Harrowgate neighborhood and instructor at the School of Management and Labor Relations at Rutgers, the State University of New Jersey. Davis, Allen and Mark Haller, editors. The Peoples of Philadelphia: A History of Ethnic Groups and Lower-Class Life, 1790-1940. Philadelphia: University of Pennsylvania Press, 1998. Holmes, George. Philadelphia’s River Wards. Mount Pleasant: Arcadia Publishing, 2003. Scranton, Philip. Figured Tapestry: Production, Markets and Power in Philadelphia Textiles, 1885-1940. New York: Cambridge University Press, 1989. Scranton, Philip. Work Sights: Industrial Philadelphia, 1880-1950. Philadelphia: Temple University Press, 1986. Weigley, Russell, editor. Philadelphia: A 300-Year History. New York: W.W. Norton & Co., 1982. Philadelphia Industry Collections and Images and News Photograph Collection, Urban Archives, Temple University Libraries Special Collection Research Center, Philadelphia. Thanks, Jacob! I had the pleasure of taking a walking tour of Harrowgate with you a few years ago. It’s really wonderful to see that fascinating tour realized here with great additional photos by Tessa Downs. I hope it encourages readers who don’t live there to visit Harrowgate themselves. I am not a native, but since moving to Harrowgate in 2001, I have gained many who are. I have been working with goals in mind to help my community & we have finally gotten Harrowgate civic back up & running. We are about to file our RCO paper work and this story about our neighborhood is an absolute gem! Thank you so much! Oh and we have a facebook page too! Harrow gate was a great neighborhood for raising our family of Four kids. The fun they had at Scanlon playground when they were little, then came baseball and socceer, and ice skating in the winter and the pool on hot summer days all at Scanlon! Vacation Bible at the Moravian Church and vacation reading at the Frankford library were a must. Taking the el into cc. I got many good buys at Jo Mar. We got to watch the circus trains go by for years from our porch and the Bobby Kennedy train passed us by on its way to his burial. Our boys sold philly pretzels, to get money for seeing movies at the Midway. They still talk about seeing Rockie and Jaws at the Midway. Sitting on the steps at night waiting for the Mr. Softie truck to come by was a really big treat. The kids didn’t need video games to entertain them. Board games and playing cards with friends was fun. Raising kids in Hawrrogate in the late 60s, 70s, and 80s sure was fun! I loved reading your research and photos! Do you have any information on the Boger and Crawford mill? I want to find out some history of the Plaza in I and Tioga street. do you know was it a native reservation burial ground ? My memories of living in Kensington were so family oriented. 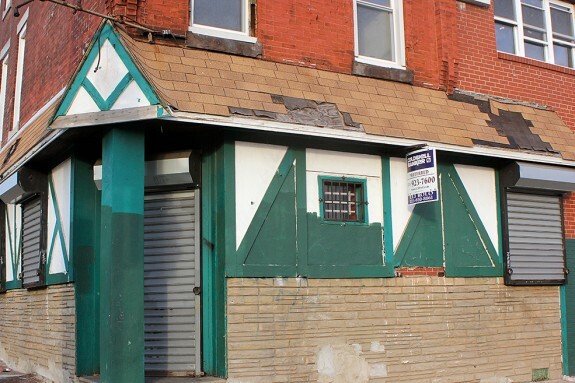 Remembering getting our hoagies at shlack’s Deli at at Rohr Street & AlleghenyAve. Going to Whimpsy Luncheonette at K& A for cheesesteaks and Cherry Cokes. Movies @ the Iris on Kensington Ave. & Midway on Allegheny Ave.Theater’s. where we all gather together to socialize. WALT the owner of the store was a blessing to all of us.